Dan Grayber is a Oakland Artist. 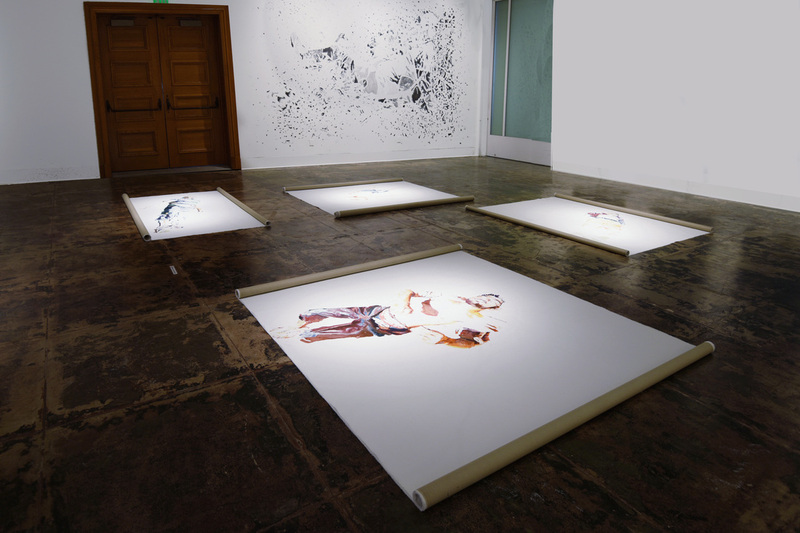 He graduated from SFAI with his MFA in 2005. He is represented by Johansson Projects in Oakland, California. I met up with Dan at his recent show at Johansson Projects and we talked about his work. Let’s start near the beginning. I read that your journey started with an interest in inventing. When did you discover that creating in the art context was a better fit for you? It was at Hampshire College, during my undergrad studies. I thought that the idea of inventing and being an inventor was what I was really looking to do- and ultimately it was. At the time though, I came to dislike the process of trying to figure out what people needed. It seemed somewhat contrived, like I was trying to force something onto someone who may not have needed or wanted it in the first place. I think I finally just figured out that there was much more space to be an inventor - how I wanted to be one - in sculpture. This led me into sort of semi-kinetic pieces. A few of them were just mechanical in nature, just a combination of materials with a machine-like aesthetic - but a couple were actual, functioning mechanisms that served a somewhat specific purpose. What would you say was the biggest difference between the two professions, inventor and artist? And what are the similarities that allow you to scratch that inventor’s itch? I think that in theory they can be pretty similar professions, with quite a few parallels as far as concept development and growth, but I would guess that intent would have to be the biggest difference that I can think of. I don’t really know enough about professional invention to comment that well on the differences. As far as the similarities that allow me to “scratch the itch”, the work that I make demands me to be an inventor or sorts. I’m constantly trying to come up with different problems and situations that I create solutions for. What is your day to day existence like? Do you teach or have another profession alongside your art making? Most of my days are spent in my studio, though I have a number of on-call jobs that I’ll take when available to supplement my studio income. These also allow me to think about other things, and stay skilled in areas that I may not focus on regularly with my sculpture. ​What kind of on-call jobs are these? What skills are you keeping up on? One of the on call positions is at the Exploratorium, a hands on experiential science museum in San Francisco. Another is for a graphics company as an installer. The skills are super random - from basic woodworking, to soldering circuit boards, to anchoring things into concrete that will be suspended over people working. Just doing a little bit of everything helps keep me entertained in what I do. You spent a few years out before returning for your MFA. What did you find yourself doing between your degrees, what motivated you to return to school? ​One of my early loves in life was whitewater kayaking, and when I wasn’t in school I was always looking for ways to stay involved with it. I had been a whitewater kayak instructor and raft guide while in undergrad for a few years, and continued for the first couple of years after school. Then, somehow, through a series of random events I found myself on an island in Texas as a manager of a bungee jumping establishment. Aside from the amazingly hot summers (that I actually got used to a bit), the job allowed me to be somewhat creative. When the business wasn’t open, there were always problems to be solved and things to be made, and the owner was very trusting and encouraging of the solutions I would come up with. The problem I had with Texas, though, was that I was living in a resort location, and never really felt connected to it socially. I decided that I wanted to get back to art, and that returning to school for an MFA was a really focused way to do it. I was looking at schools in various urban centers, and ended up choosing to come to San Francisco to attend SFAI. What are some of your main visual inspirations that inform your designs? I’m constantly looking for interesting movements and structures. In the past I’ve made pieces visually informed by spiders, by cranes and bridges, even by the game “cat’s cradle” - that one you play as kids with your fingers and a loop of string. If I find something that interests me visually, I’ll usually take a photo, or a quick note. Sometimes it just brews in the back of my mind for a bit. These things really inform the designs I create quite a bit, but really only come into play if they work with a concept that I’m thinking about. I’m really drawn to things that highlight tension. I look at the work of Kenneth Snelson and I’m just blown away at how he uses tension to create some amazing, gravity defying structures. Tensegrity, a concept developed by Snelson with Buckminster Fuller, is something that I’ve returned to again and again over the years as inspiration. I’ve definitely got elements of it in my work, but have yet to use it in it’s pure form in any of my sculptures. Your sculptures are more than self-serving mechanisms, they speak to relationships and equilibriums. Can you tell me more about the metaphors these pieces are based on? Besides the visual inspirations that inform the sculptures I make, I also think a lot about personal relationships - what it’s like to be alone, as well as, what it’s like to work together with a partner, and the roles the we play in relationships. 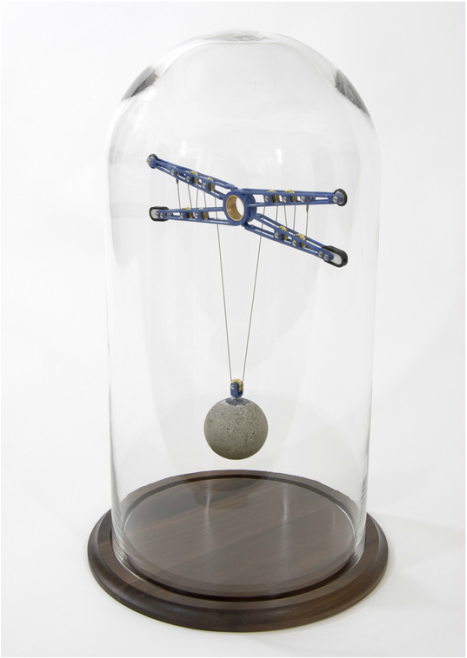 In 2005, I started to use counterweights to add tension into my pieces. I was really interested in the notion that the very thing working against the mechanism, by pulling it off the wall, was simultaneously the only thing adding the tension which held it in place. There was definitely this question of what is holding up what, in the work. While at the beginning I wasn’t directly thinking about interpersonal relationships it started to come into play. Cavity Mechanism #6, from 2009, is one of the most obvious pieces to speak about interpersonal relationships that I’ve made. 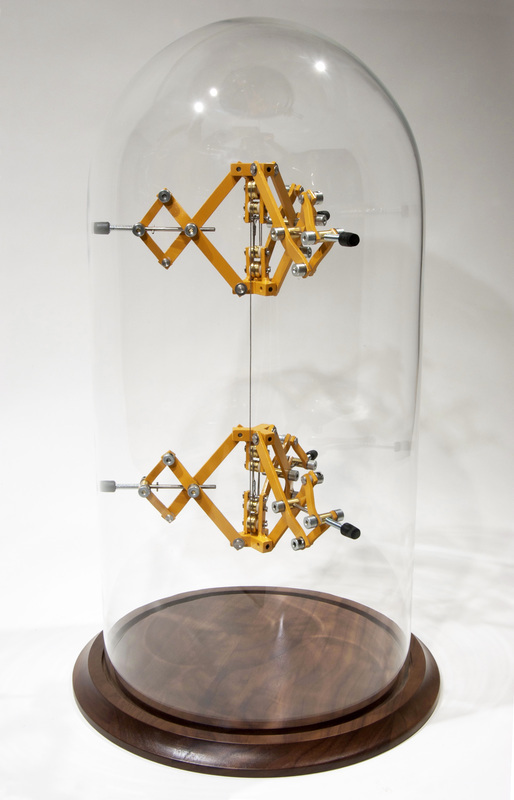 There are two identical mechanisms inside of a glass display dome, and one small cable that runs between the two mechanisms. This cable holds all of the tension between the two mechanisms, and they both need to remain in place to maintain the tension. I was really thinking about co-dependence when I made the piece. If either mechanism were to slip, or the connection between them to break, it would cause both to fail. "I ... think a lot about personal relationships - what it’s like to be alone, as well as, what it’s like to work together with a partner, and the roles the we play in relationships. " When I got a tour of your show at Johansson, I was privy to some very interesting stories about what happens when this equilibrium doesn’t work out. Can you tell us about a time when it all went wrong? ​Sure. The piece was Rosebowl Mechanism from 2007 (formerly titled Fishbowl Mechanism because I didn’t know what a rosebowl was). I had been working on a series of “Symbiotic” mechanism systems at the time. They all include a vessel, with a mechanism that fits inside it which worked with a mechanical base. 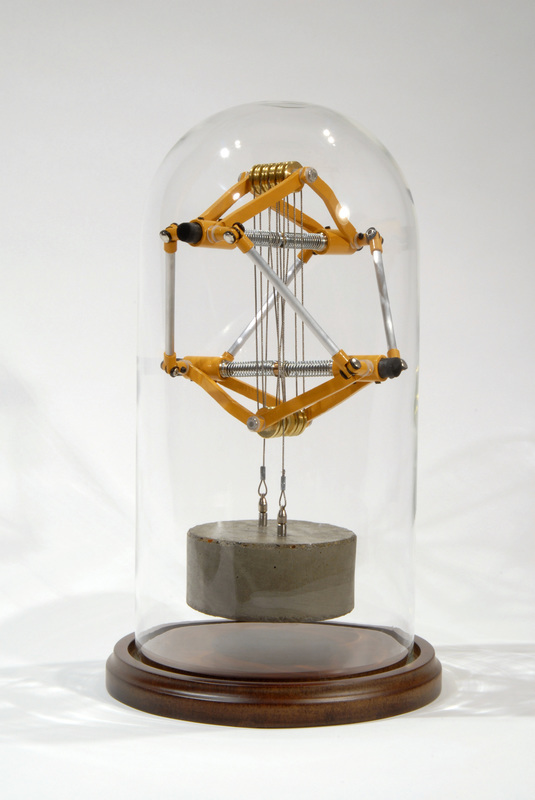 The weight of the vessel and the mechanism sitting on the base creates enough tension to open the mechanism inside of the vessel. Once the mechanism has wedged itself inside of the vessel, that creates tension which is transferred to the mechanical base to support the vessel. The mechanism in the rosebowl had brass arms. I chose to use the brass because I thought that the brass would slide on the inside of the bowl, centering the mechanism on the curved walls. 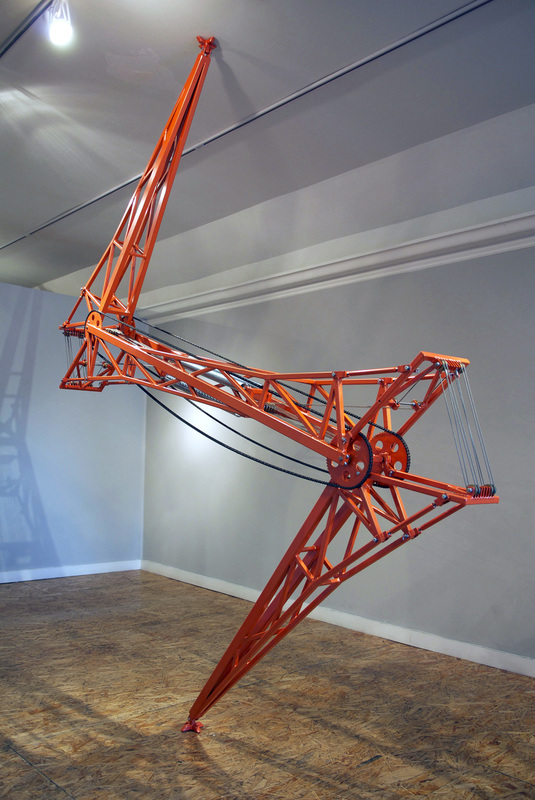 I was having a show in SF at the time and had installed the piece. A few hours later, while working on other pieces, I heard an audible pop. Upon inspection I found that one of the brass arms had blown out a small circular hole in the side of the bowl. The bowl was a pretty cheap yard sale buy I found while walking around my neighborhood one day, and I had been interested in the idea of this pretty cheap, not readily replaceable, piece of random glass being the base form that the whole sculpture was based on. That is until the random piece of found glass broke only days before my show opened. I searched every goodwill, and antique store I could think of in SF and found nothing. I looked online, and also had friends and family looking as well. We couldn’t find anything, so the show opened with the hole in the side of the vessel. Weeks later, my parents found a replacement while searching in the southeast US. Oddly enough, that replacement shattered in my hands while I was cleaning it years later. "We couldn’t find anything, so the show opened with the hole in the side of the vessel. " 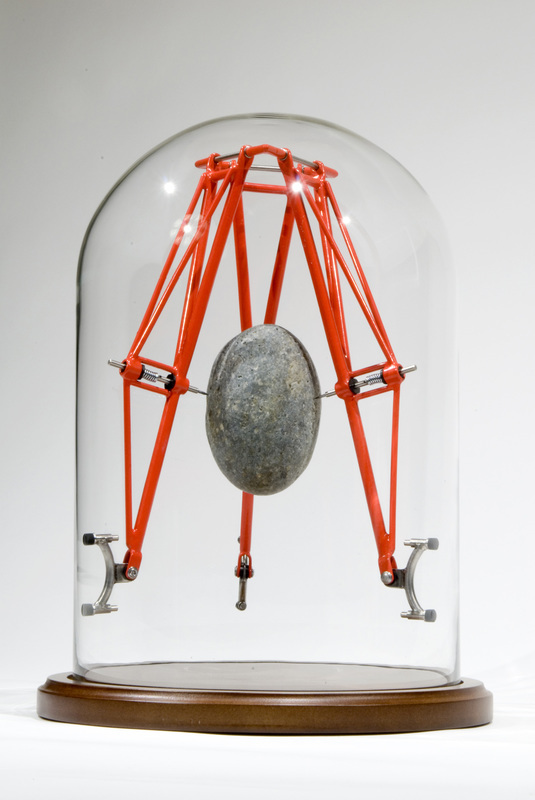 In your more recent work there is this great tension between natural materials like rocks and manufactured materials like metal, gears, glass. How do you see the objects relationship within itself- between the natural and manufactured aspects? I’ve always been interested in how different materials dictate the ways in which they are used together. Regardless of the materials, there is always a method on how the interface occurs - it could be a standardly used practice, or a newly thought up connection. Because natural materials are inherently imprecise in their dimensions, the interface with the fabricated mechanism becomes (at least to me) a visual highlight. The newer pieces where the mechanisms actually “grab” the rocks are particularly interesting to me. 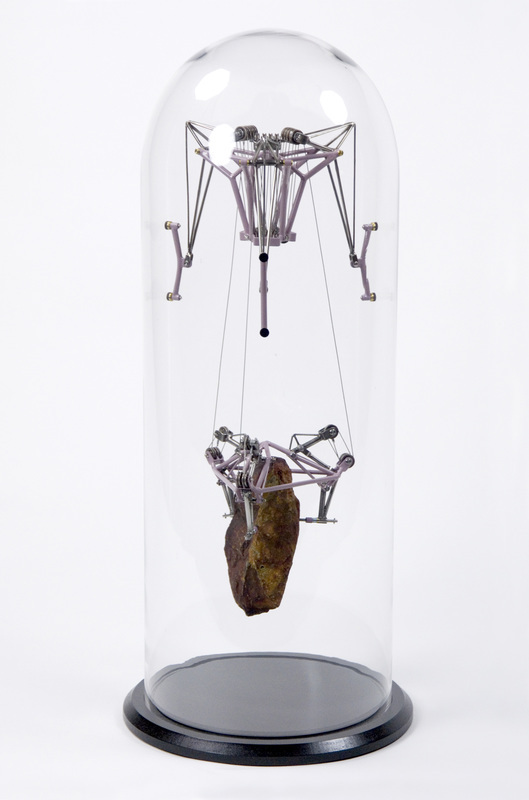 The rocks not only throw another element of potential failure into the mechanisms, but the gripping of the rock is also kind of a reciprocal action to the gripping of the glass (or whatever surface the piece is installed in or on). 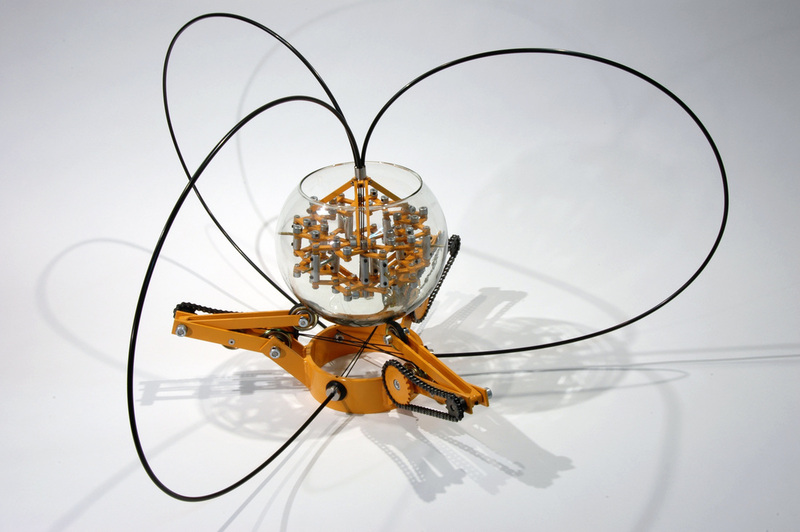 Before the integration of natural materials entered your work, each section of your mechanisms blended together, creating a robotic like creature. Looking back on this development, was there an “ah ha” moment or memorable shift that brought you to use natural rocks as counter weights? I think that the shift that you are thinking of really came with the addition of hanging counterweights to the pieces. Before the hanging counterweights, the mechanisms contained springs which, for the most part, were contained within the bodies and arms of the mechanisms.The “ah ha” moment with the rocks really came during a camping trip up on the Yuba river. I had been using concrete counterweights that I would create myself for years. When walking along a rocky shoal of the river I was pretty drawn to the river rocks that had all collected along the side. I thought that some of the rocks looked heavier than a similarly sized piece of concrete. I wasn’t really concerned with whether they were heavier or not, but I thought that they conveyed this appearance of being heavier, which is what I was attracted to. Rocks definitely don’t work for every sculpture I make - and I still plan on using concrete on some future pieces, but they are really engaging to work with for now. 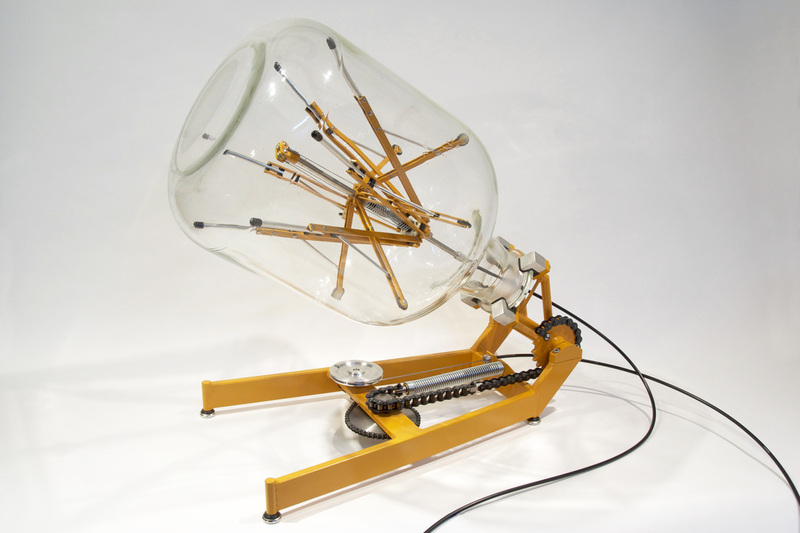 You work on a variable scale, from large scale installations to small bell jars. What scale do you crave to create? ​I really love the scale of the pieces that I’m currently making. That being said, I think it would be really fun to create a very large piece at some point. It’s hard to justify the costs of making and storing large work, and my studio just isn’t set up for that kind of work right now. Your creations have taken on a relationship with their space. Through their dependency on a corner or section of wall they are able to hover. Have you ever tried to involve people or interaction? Or would this take away the machine’s sole purpose of self-existence and muddy the human uselessness of your creations? In undergrad, the sculptures that I was making that were closest to what I am doing now did have interaction points, but they were just for installation. I think that they led me towards the work that I am making now, but I view them as totally different. I really see the current works as sort of closed systems, there is a balance and an equilibrium that wouldn’t be possible if they were interactive. I want to take a second to bring attention to the fact that almost all these pieces are installed inside of glass containers! I understand that some are easier to install than others and I’m amazed to hear that you have only had 3 jars break over the years. Can you enlighten our readers to the complexity that goes into installing one of your sculptures? On a mental recount, I realize that it’s actually 4. Possibly one of the things that I overlook the most when designing a piece is how it will be installed. On multiple occasions I have completed pieces only to find out that my hands don’t fit, or I need a third hand, or that the method for installing the piece that I had thought of doesn’t work. ​3 of the four times I’ve broken the glass, it’s been while installing the piece, and usually when I’m just trying to figure out how to install it. A bunch of my newer two-part mechanism and rock pieces install very similarly to each other. If the piece is going into a dome, I’ll usually start by trying to give myself a reference line to work with. A ring of paper drywall tape wrapped around the dome is a pretty good way to give myself a close to level circumference. At this point the dome will be on it’s side, on a towel (with the sides rolled in, to prevent the dome from rolling away). Next I’ll collapse the upper mechanism while making sure that the cable runs over all of the pulleys and that arms and lever are in the right positions to be installed. While holding the top with one hand, I’ll do the same to the lower mechanism and pull it (without a rock) until the cables have tensioned a little. Now I carefully insert the mechanism into the dome until it’s where it needs to be (sometimes this takes multiple attempts as things misalign and cables slip off pulleys). Once it’s where it needs to be I’ll tension the lines with the lower mechanism to open it up. The next step is tricky. While maintaining tension on the cables to hold (the now unsupported) top mechanism in place, I try to open up the lower mechanism and fit the rock into it. Now using one hand to hold the rock and lower mechanism and maintain enough tension to hold everything in place, I’ll use my other hand as well as the wrist of the hand inside the dome to raise the dome vertical, to the edge of a table. At this point it’s just a matter of carefully releasing everything, while watching carefully and being ready to grab things in case of a slip. 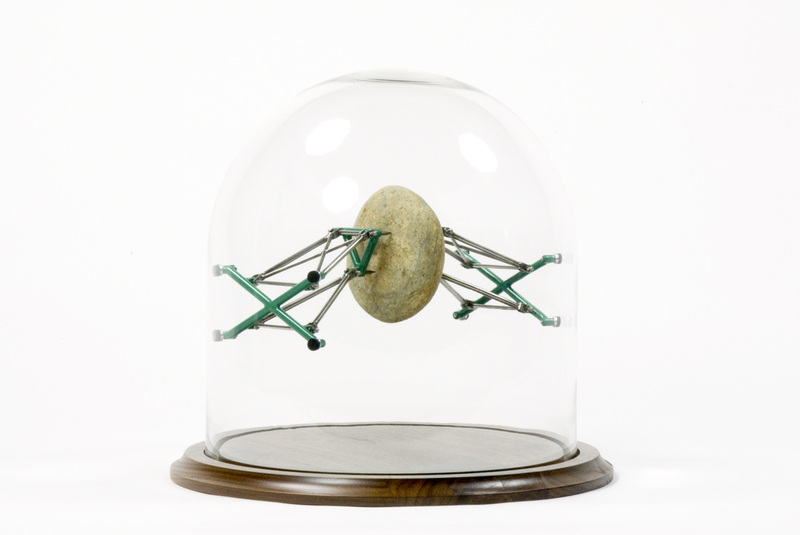 "...the sculptures physically grab and hold on to the stones." You’ve just had a show at Johansson Projects over the summer. What did you discover about your work while preparing for this show, and in what direction do you find yourself exploring as you embark forward? ​This show marks the first show I’ve had while spending most of my time in the studio. In the past, I’ve always had full time work, and the studio has been something I’d make time for on the side. That’s a pretty huge change for me. It’s been really great to be able to work on some super labor intensive pieces that don’t have to be spread out over a year to make. 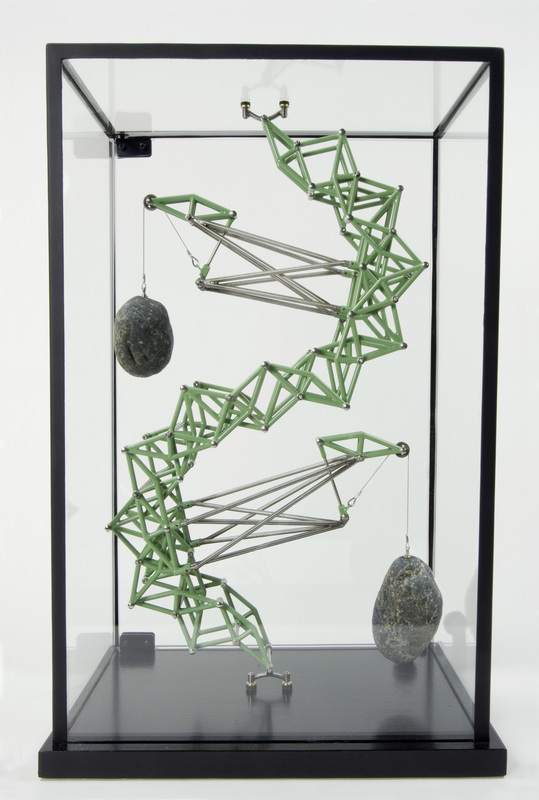 Additionally, some of the pieces in this show are the first I’ve made that mechanically hold the counterweights - the sculptures physically grab and hold on to the stones. In the past, the weights have always been permanently fastened to the cable. I’ve been really excited by this idea and plan on exploring it quite a bit in the next pieces I create. Do you have any plans for your work coming up? Other shows/ opportunities by which we will have a chance to see more of your work? There is a very slight variation on the two mechanism pieces that I’ll be exploring soon. I’ve been thinking about pieces that are visually more symmetrical top to bottom. I’m interested in the possible symmetry connecting the perceived function of the two mechanisms. That’s a pretty vague description, but I really haven’t made it past a general scribble in my sketchbook yet. For exhibitions, though, at the moment I haven’t been asked to participate in any upcoming shows. With the show at Johansson Projects, I hadn’t been actively searching for opportunities, I’d just been focused on getting everything done for that show. Now that that work is completed, I’ll refocus my efforts on figuring out what’s next. I have my website, and I do post updates about my work, and studio progress photos on social media sites like Instagram - so there’s that, if you’re looking. ​Thanks for talking with us Dan!